Jabra GN9350 vs Plantronics W740 - Headsets Direct, Inc. Comparing the Jabra GN9350 headset with the Plantronics W740, the Plantronics W740 wins! When comparing the Jabra GN9350 headset with the Plantronics W740, the information below shows the Plantronics W740 to give more value for your headset investment. Plantronics W740 connects to three devices. Jabra GN9350 connects to two.The key feature to both of these headsets is versatility. Using one headset for multiple applications save you money because you don’t need additional headsets and it saves time not changing from one headset to another. 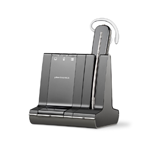 The Plantronics W740 connects to your desk phone, PC and mobile phone. 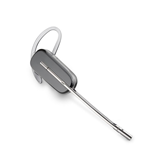 Plantronics W740 weighs 21 grams. Jabra GN9350 weighs 26 grams. When you’re wearing a headset 6-8 hours a day, being lightweight and comfortable will ultimately determine if you like your headset or not. Both the Plantronics W740 and Jabra GN9350 are comfortable and have multiple wearing styles but the Plantronics W740 weights 5 grams less – That’s 20%! When it comes to distance, both are industry bests. Both the Jabra GN9350 and Plantronics W740 provide up to 350 feet of roaming distance. The standard Jabra 9350 has a 300 foot range but the Jabra GN 9350e is 350 feet. Answer and Hang-up Remote capabilities. One of the best features of any wireless headset is the ability to answer and hang-up remotely. Both the Jabra Gn9350 and Plantronics W740 have handset lifters which are compatible with most phones to support answer/hang-up remotely. Both also offer Electronic Hook Switches for a growing number of desk phones which uses a cable for remote answer/hang-up instead of the mechanical lifter. 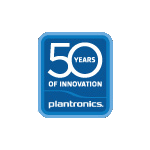 We have found time and time again Plantronics’ after sale support is unparallelled in the headset industry. If you need a replacement unit, Plantronics quickly sends a replacement unit to get you up and going. No questions, delays or run-around. They simply want you up and going with their headsets working properly. We’re so confident in the Plantronics W740 outperforming the Jabra GN9350 headset, we have a 60-day money back guarantee. Try it for 60 days and if you’re not 100% satisfied, return it. No questions asked. How Do I Order?Order now on our fast and secure website or call 1-800-914-7996 today!